BODY RESTORATION BEGAN OVER 10 YEARS AGO WITH FULL BARE METAL REPAINT IN ORIGINAL WHITE. THE INTERIOR IS IN EXCELLENT ORIGINAL CONDITION. The engine has done less than 1000 miles since complete re-build and has been lightly modified to produce about 135/140 horsepower. It has been bored to 2 Litre specification with a Sports Camshaft, fitted with Twin Weber Carburetors, Extractor Exhaust and Sports System. Currently fitted with special Front Seats and original Front Seats are included. Door Trims and rear Upholstery is perfect. Slightly wider Wheels are fitted with new Tyres. This car drives particularly well and there is nothing to spend. 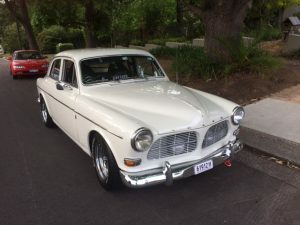 The cost to prepare this car has far exceeded $40,000.00 – it can only be described as immaculate. The owner has been transferred overseas and he has asked me to sell his car for him. The asking price was only $20,000.00. 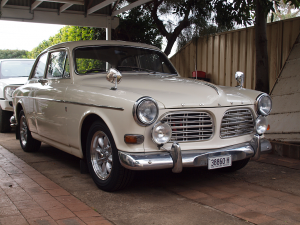 Contact: GERRY LISTER at Volvo Downunder Spares on 61 2 9499 6666 or mobile 61 412 221 211.